Napoleon (Napoleon Bonaparte or, after 1804, Napoleon I, Emperor of the French) (15 August 1769 – 5 May 1821) was a world historic figure and authoritarian ruler of France as First Consul from 1799 to 1804, and Emperor of the French, 1804 to 1814. He revolutionized the military applications of artillery, and routinely moved his troops faster and with fewer supplies than was then thought possible, allowing for amazingly large and rapid concentrations of force against his slower and less adaptable enemies. His most used tactic wat to lead a surge into the center of his enemy, dividing them and then bring his remaining forces into a flanking formation and give the opposing army no option but to surrender or retreat. As a civil leader he played a major role in the French Revolution, then ended democracy and became First Consul in 1799 and Emperor of France in 1804. He modernized the French military, fiscal, political legal and religious systems. The Napoleonic Civil Code is considered the first successful codification that strongly influenced the law of many other countries. Napoleon was constantly at war against Britain with a complex, ever-changing coalition of European nations on both sides. Refusing to compromise after his immense defeat in Russia in 1812, he was overwhelmed by a coalition of enemies, forced to abdicate in 1814 and sent into exile at Elba (an island near Rome). In 1815, after escaping from Elba, he took control of France again, raised a new army, and almost succeeded in defeating the isolated Prussian and British forces but was defeated at the Battle of Waterloo. He was exiled to St. Helena—a remote island in the South Atlantic, where he died. Napoleon's image and memory are central to French national identity, but he is despised by the British and Russians and is a controversial figure in Germany and elsewhere in Europe. He was born Napoleone di Buonaparte in the town of Ajaccio, one year after the island of Corsica was transferred to France by the Republic of Genoa. He was the second son of Carlo Buonaparte, a lawyer of the minor nobility; his mother was Marie-Letizia Bonaparte. The Buonopartes, proud members of the lower aristocracy, were destitute. Carlo Buonaparte had fought for Corsican independence under Pasquale Paoli; he now switched and became a supporter of the French regime, which recognized his noble rank. When the King offered free education to impoverished noble families, Napoleon and several siblings were educated at royal expense. In 1779, after a few months' schooling at Autun to improve his French—he always had a thick Corsican accent—Napoleon entered the military academy at Brienne, which was run by a Catholic religious order. He remained there for five years. Taunted by his schoolmates as being provincial from the wildest, newest and most violent part of France, and uncouth, he professed an intense Corsican patriotism and hatred of the French "oppressors." In 1784 he was selected to attend the top-ranked Ecole Militaire in Paris to study the science and mathematics of artillery. Napoleon spent the year in luxury such as he had never known before, and graduated 42nd in a class of 130. Commissioned as second lieutenant of artillery, he was sent to Valence in southern France. There was revolution in the air; Napoleon was an intellectual and an ardent disciple of Voltaire, Rousseau and the philosophes; he saluted the people but hated mob violence. During his 10 years as a junior officer made five extended trips to Corsica, seeking a politico-military career, alongside Paoli or against him. He took prolonged leaves, adding up to three years in seven, sometimes failing to report back on time. In June 1793 Napoleon in Corsica was defeated by the Paolists; he and his family fled to France, joined the French revolutionary cause and forgot Corsica. He easily defeated the 60,000-man army of the Mamelukes (horsemen) at the Battle of the Pyramids (July 21, 1798). Intending to transplant French liberty to Egypt, Napoleon encountered stiff resistance and reacted with the same barbarism and repression used by the Ottomans. The British under Admiral Horatio Nelson sank Napoleon's entire fleet at the Battle of the Nile (August 1, 1798), trapping the French army as the Turkish main army approached. Napoleon attacked first, invading Syria and defeating the Turks in a bloody massacre. As he laid siege to Acre, plague broke out among his troops, forcing Napoleon to retreat back to Egypt. At the Battle of Aboukir (July 25, 1799), his 6000 men defeated a Turkish force three times as strong. Napoleon then slipped through the blockade and returned to France. Although he won great victories in Egypt, disease and the heat decimated his ranks. He left most of his forces in Egypt under the command of Jean-Baptiste Kleber, who continued to fight in Egypt for another two years. Despite the failures in Egypt, Napoleon returned to a hero's welcome. In alliance with the director Emmanuel Sieyès and his brother, Lucien Bonaparte, president of the council of five hundred, he forced the Council of 500 into electing a consular government as the executive branch. Napoleon became "first consul" for ten years, with two consuls appointed by him who had consultative voices only. His power was confirmed by the new constitution ("Constitution of the year VIII"), originally devised by Sieyès to give Napoleon a minor role, but rewritten by Napoleon, and accepted by direct popular vote (3,000,000 in favor, 1,567 opposed). The constitution preserved the appearance of a republic but in reality established a military dictatorship. The days of Brumaire sounded the end of the short-lived republic: there was no longer an elected representative government. The long string of wars was broken by the Treaty of Amiens (1802), which proved to be only a 14-month pause. Napoleon used the interlude to make major territorial gains in Italy and Germany without firing a shot, an unexpected development that forced the British back to the battlefield. Napoleon's major adventure into the Caribbean—sending 30,000 troops in 1802 to retake Saint Domingue (Haiti) from ex-slaves under Toussaint L'Ouverture who had revolted. Napoleon wanted to preserve France's financial benefits from the colony's sugar and coffee crops; he then planned to establish a major base at New Orleans. He therefore reestablished slavery in Haiti and Guadeloupe, where it had been abolished after rebellions. Slaves and black freedmen fought the French for their freedom and independence. Revolutionary ideals played a central role in the fighting for it was the slaves and their comrades who were fighting for the revolutionary ideals of freedom and equality, while the French troops under General Charles Leclerc fought to restore the order of the ancien régime. The goal of reestablishing slavery - which explicitly contradicted the ideals of the French Revolution - demoralized the French troops. The demoralized French soldiers were unable to cope with the tropical diseases, and most died of yellow fever. Slavery was reimposed in Guadeloupe but not in Haiti, which became an independent black republic. Napoleon's vast colonial dreams for Egypt, India, the Caribbean, Louisiana, and even Australia were all doomed for lack of a fleet capable of matching Britain's Royal Navy. Realizing the fiasco Napoleon liquidated the Haiti project, brought home the survivors and sold off Louisiana to the U.S.
His spectacular failure in Russia in 1812 was due primarily to his bad logistical planning, a blunder historians have been unable to explain. In battle he paid close attention to the overall picture, but left the critical decisions to his marshals. He rarely issued detailed guidance on corps level tactical employment; instead he devised the overall battle plans, and directed the combined attacks of infantry, cavalry reserves, and massed batteries of guns. Since he was simultaneously head of the government, he integrated the military, political and diplomatic dimensions. He was an accurate judge of his opponents, except that is for Britain and Russia. He could never be at peace with Britain; with Russia he let his need for diplomatic prestige overcome his military judgment. The Battle of Austerlitz on 2 December 1805 is celebrated as Napoleon's greatest victory. The collapse of the Peace of Amiens led Britain to assemble the "Third Coalition" in April 1805, including Austria, Russia, and Sweden. After threatening to invade Britain, Napoleon sent 200,000 soldiers marching east. He used six army corps, each a self-contained, all-arms combat force. The corps was a Napoleonic invention, and each was strong enough to operate independently, allowing the army to advance along a broad front, which facilitated logistics (each army seized supplies in its region), and increased the speed of the advance. Napoleon commanded in person in Germany; relying on the support of most of the south German states, he advanced to meet the Austrians who had invaded Bavaria. On the upper Danube he concentrated his 200,000 men, reinforced by Bernadotte, and by allied from Bavaria, Württemberg, Baden, Hesse, Nassau. After the Austrians had been defeated in several engagements, their main army was surrounded at Ulm and surrendered 30,000 men on October 17, 1805 without a fight. The British navy won a total victory under Horatio Nelson sinking the combined French and Spanish fleet at Trafalgar on October 21, 1805, permanently destroying Napoleon's sea power. On December 2, 1805, at the Battle of Austerlitz, called "the battle of the three emperors," Napoleon split the enemy center, encircled the enemy left, and won a smashing victory over the united forces of Austria and Russia. Napoleon lost 9000 men, the enemy 26,000. Austria made peace; the Russians retreated. The Peace of Pressburg deprived Austria of territory and forced her to pay an indemnity. Napoleon then turned his attention to Prussia, who was going to attack France but didn't mobilize in time for the fighting. Napoleon declared war after the conclusion of the Peace of Pressburg and destroyed the Prussian army at the battle of Jena-Aurstadt. Napoleon, remembering that Russia hadn't sued for peace after Austerlitz decided to pursue the retreating Russian army through Poland. He enjoyed early success, pushing the Russians back and capturing Warsaw but was weakened at a bloody stalemate at Eylau. Napoleon, determined on a "spring recovery" pushed the Russians further into Poland, delivering a crippling blow at the Battle of Friedland. The Peace of Tilsit between Prussia, Russia and France did little to the Russians, instead depriving Prussia of huge amounts of land while Russia only had to give up part of Poland. Aside from that, Prussia had to pay an indemnity and had its army restricted to a certain size while Russia only had outlaw British goods from its ports. Napoleon and the Tsar became close friends after the Treaty. In 1807 Napoleon created a powerful outpost of his empire in Eastern Europe. Poland had recently been divided up by its neighbors, but Napoleon created the Grand Duchy of Warsaw, which depended on France from the very beginning. The duchy consisted of lands seized in Russia, Austria, and Prussia; its Grand Duke was Napoleon's ally the king of Saxony, but Napoleon appointed the intendants who ran the country. The 2.5 million Poles thrilled to the opportunity and by 1814 sent about 200,000 men to Napoleon's armies, including about 90,000 who marched with him to Moscow. The Russians strongly opposed any move toward an independent Poland and to punish them Napoleon invaded in 1812. Napoleon's impact on Poland was dramatic, including the Napoleonic legal code, the abolition of serfdom, and the introduction of modern middle class bureaucracies. The fiasco in Russia in 1812 wounded Napoleon's political prestige, emptied his treasury and encouraged his enemies to greater exertions and nations on the fence to turn against France. 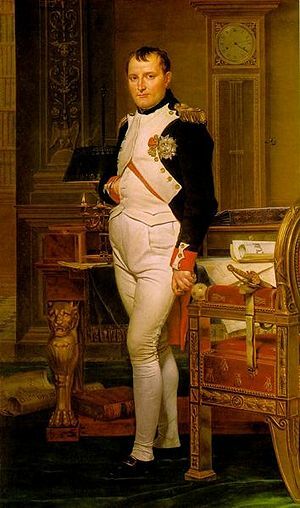 Diplomatic historians blame Napoleon's inflexibility and unwillingness to compromise when he was winning (before Russia), and, especially, when the odds had turned against him in 1813-14; in January 1813, Napoleon rejected Prussian terms; that summer he mishandled Austria; in early 1814 he fumbled the final offer of peace made at Chatillon in March 1814. That political failure doomed him. The Allies then signed a 20-year alliance (the Treaty of Chaumont), stuck together, and switched Bavaria away from Napoleon. Napoleon's decisive defeat came at the Battle of Leipzig, called "the battle of nations" in October 1813. Napoleon's 180,000 French and Saxon and Württemberg troops were overwhelmed by 320,000 Allies, comprising Austrian, Russian, and Prussian armies. It was the biggest battle to date in European history, with 100,000 to 120,000 killed, wounded or captured on both sides. Napoleon managed to escape to France with a portion of his army, but the disaster was almost as great as that in Russia in 1812 and even more irreparable; all the German states now joined the Allies, the Dutch expelled the French, and Denmark was forced to accept terms. In early January, 1814, 200,000 Allied troops invaded France. Napoleon scored some small victories but the Allies took Paris on March 31, his government declared him deposed, and his marshals deserted him. Napoleon abdicated and was sent into exile at Elba (an island off the Tuscan coast, north of Rome), as the old monarchy was brought back to France. The French army, now controlled by Louis XVIII numbered 460,000 men, but most were still loyal to Napoleon. Napoleon centralized power in Paris, with all the provinces governed by all-powerful prefects whom he selected. They were more powerful than royal intendants of the ancient régime and had a long-term impact in unifying the nation, minimizing regional differences, and shifting all decisions to Paris. Religion had been a major issue during the French Revolution, and Napoleon resolved most of the outstanding problems. Thereby he moved the clergy and large numbers of devout Catholics from hostility to the government to support for him. The Catholic system was reestablished by the Concordat of 1801 (signed with Pope Pius VII), so that church life returned to normal; the church lands were not restored, but the Jesuits were allowed back in and the bitter fights between the government and Church ended. Protestants and atheists were tolerated. The French taxation system had collapsed in the 1780s. In the 1790s the government seized and sold church lands and lands of exiled aristocrats. Napoleon instituted a modern, efficient tax system that guaranteed a steady flow of revenues and made long-term financing possible. Napoleon kept the system of conscription that had been created in the 1790s, so that every young man served in the army, which could be rapidly expanded even as it was based on a core of careerist sergeants and talented officers. Before the Revolution the aristocracy formed the officer corps. Now promotion was by merit and achievement—every private carried a marshal's baton, it was said. Statue of Napoleon at l'Hotel des Invalides' Honor Courtyard, Paris. Paul Delaroche, Bonaparte franchissant les Alpes. All historians agree that Napoleon's remarkable personality was one key to his influence. Although not physically imposing, in one-on-one situations he immediately had a hypnotic impact on people and seemingly bent the strongest leaders to his will. Second his intellectual powers were unrivaled. He had a photographic memory for facts, people, events, numbers, military units and maps. He devoured statistical information and reports, memorized maps, and had a perfect recall of a fantastic stock of information. He had a thorough command of military technology, as well as the financial and diplomatic secrets of France. He could instantly organize and integrate all that information, generating brilliant insights on complex situations. He could organize his own thoughts and rapidly dictate a series of complex commands to all his subordinates, keeping in mind where each major unit was expected to be at every future point, and like a chess master, "seeing" the best plays many moves ahead. Combined with his inexhaustible energy, he kept relays of staff and secretaries at work. Unlike many generals Napoleon did not turn to history to ask what Hannibal or Alexander or whoever did in a similar situation. After 1812 Napoleon seems to have lost his old verve. On the great Russian campaign of 1812, with crisis after crisis at hand, he rarely rose to the occasion. After that debacle compatriots noticed a loss of the old flair. Some historians have suggested a physical deterioration, but others note that an impaired Napoleon was still a brilliant general. In terms of impact on events, it was more than Napoleon's personality that took effect. He chose outstanding generals, and stood by them. He reorganized France itself to supply the men and money needed for great wars. Above all he inspired his men—Wellington said his presence on the battlefield was worth 40,000 soldiers, for he inspired confidence from privates to field marshals. The force of his personality neutralized material difficulties as his soldiers fought with the confidence that with Napoleon in charge they would surely win. Napoleon's ambition and drive inspired the term "Napoleonic Complex", which is used to describe a person who overcompensates for shortness or other physical deficiencies by excessive aggressiveness or will to dominate other people. He married first Josephine Beauharnais (9 March 1796) and later Marie-Louise of Austria (11 March 1810). His only son, Napoleon II (1811 - 1832) the King of Rome, died at the age of 21. "Alexander, Caesar, Charlemagne, and myself founded empires; but what foundation did we rest the creations of our genius? Upon force. Jesus Christ founded an empire upon love; and at this hour millions of men would die for Him." The tomb of Napoleon at Les Invalides, in Paris. Statue of Napoleon I, at Place Vendome, Paris, by Auguste Dumont. Hazareesingh (2004) explores how Napoleon's image and memory is best understood as playing a key role in collective political defiance of the Bourbon restoration monarchy in 1815-30. People from all walks of life and all areas of France, particularly Napoleonic veterans, drew on the Napoleonic legacy and its connections with the ideals of the 1789 revolution. They spread rumors of Napoleon's return from St. Helena; many talked openly of Napoleon as the great inspiration for French patriotism and for individual and collective liberties. A pro-Napoleon political mobilization appeared in open displays of the tricolor and rosettes, as well as celebrations of anniversaries of Napoleon's triumphs. Royal celebrations were disrupted by raucous laughter and buffoonery as the many supporters of Napoleon worked, without any central coordination, to destabilize the Bourbon regime. Datta (2005) shows that following the collapse of militaristic Boulangism in the late 1880s, the Napoleonic legend was divorced from party politics and revived in popular culture. Concentrating on plays and novels from the period 1893-1913, Datta examines how writers and critics of the "Belle Epoque" exploited the Napoleonic legend for diverse political and cultural ends. Reduced to a minor character, the new fictional Napoleon was not a world historical figure but an intimate one fashioned by each individual's needs and consumed as popular entertainment. In their attempts to represent the emperor as a figure of national unity, proponents and detractors of the Third Republic used the legend as a vehicle for exploring anxieties about gender and fears about the processes of democratization that accompanied this new era of mass politics and culture. Antoine Jean Gros, Napoleon at Arcola (detail). Napoleon on the Battlefield of Eylau (detail), 1808. Nafziger, George F. Historical Dictionary of the Napoleonic Era. 2002. 353 pp. Nicholls, David. Napoleon: A Biographical Companion. 1999. 300 pp. Pope, Stephen. Dictionary of the Napoleonic Wars. (2000). 572 pp. Coote, Stephen. Napoleon and the Hundred Days. (2005). 320 pp. Duffy, Christopher. Borodino and the War of 1812 (1999). Forrest, Alan. Napoleon's Men: The Soldiers of the Revolution and Empire. 2002. 248 pp. Gates, David. The Napoleonic Wars, 1803-1815 (1997) 304pp; attacks Connolly and says N's "brilliance as a military commander has rarely been equalled let alone surpassed"
Kagan, Frederick W. "Russia's Wars with Napoleon: 1805–1815," in The Military History of Tsarist Russia, ed. Frederick W. Kagan and Robin Higham (2002), 106–22. Nosworthy, Brent. With Musket, Cannon and Sword: Battle Tactics of Napoleon and His Enemies. (1996). 528 pp. Blanning, T.C.W. The French Revolutionary Wars 1787-1802 (1996). Muir, Rory. Britain and the Defeat of Napoleon, 1807-1815. (1996). 466 pp. Heit, Siegfried. "German Romanticism: an Ideological Response to Napoleon," Consortium on Revolutionary Europe 1750-1850: Proceedings 1980 1: 187-197. Argues that German opposition to Napoleon led German Romanticism to reject the chief ideals represented by the French Revolution and Napoleon. Uses the works of Arndt, Johann Fichte, Jahn, Kleist, and Schleiermacher, to show how German Romanticism became identified with political reaction and nationalism, and how it opposed political liberalism, rationalism, neoclassicism, and cosmopolitanism. O'Brien, David. After the Revolution: Antoine-Jean Gros, Painting and Propaganda under Napoleon (2006) 288p. Prendergast, Christopher (1997). Napoleon and History Painting: Antoine-Jean Gros's La Bataille d'Eylau. Oxford: Clarendon Press. ISBN 0-19-817422-5. This page has been accessed 126,490 times.